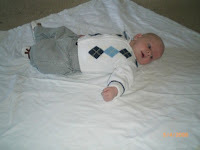 Aiden is now 2 months old. He went to the doctor today and weighed 13 lbs and 12 oz and 23 3/4 in long. He's a BIG baby! He also had his shots today and didn't take it too well. But it didn't help that he was really tired and they had to wake him up to do it. I don't think any one would like to be woken up that way. My awesome sister Charla sent me flowers for my birthday...aren't they pretty?!?! The past couple of months I have planned our little trip to Memphis. As I did my research on the City of Memphis and all the many things to do, I started to get really excited for our trip. But when ever I would tell people we were going to Memphis for Memorial Weekend it was always, "Why?" And never just a why out of curiosity, it was more of a why out of curiosity and disgust. I would always answer back with all the things to do. What has been funny, as we have gone about our trip and met many people from Memphis, they have always asked where are we heading...like we are not staying in Memphis. So here is a list of reason to go to Memphis if you have never been, because we really did have a great time. This morning we went to the Memphis Zoo. It was a really nice zoo that had a lot of animals you don't normally see at zoos like penguins, polar bears, and panda bears. It is actually only 1 of 4 zoos in the United States that has panda bears. They also have sea lions. This little girl used a purple cup and had the sea lion doing circles, jumping, and swimming around. She had the sea lion following her every move. It was so cute. It started to rain right when we were leaving...how perfect is that? After the zoo Adam took the boys swimming while Aiden and I took a little nap. This evening we went to Corky's bar-be-que. It is known around the world for their bar-be-que. We of course had ribs and they were delicious! This morning we went to church and then back to the hotel for a little bit of rest. We decided to do some shopping...I had some birthday money to spend! Momma got a new pair of shoes...actually 2 pairs. I have my eye on a third but they didn't have my size. We are going to try at the other mall and see if we can find them there. After shopping we went to eat at J Alexanders which is our favorite restuarant. We have only been to the one in K.C. so couldn't resist to go to this one. After church we took a little drive up north to see the temple. We didn't realize Memphis had a temple so we wanted to check it out. It's pretty crazy because it is literally feet away from the Stake Center. Next was the Riverboats. We had a great time on the Riverboats and learned a lot about the history of Memphis. It was really pretty. The boys had fun on the boat. Although Xavier was disappointed that we didn't see any alligators and Damon was just upset that we didn't buy him nachos. Aiden was a good baby and slept most of the ride. Today was Damon's field day at school. So Xavier, Aiden and I went to watch Damon in all the races. They even did one race for the preschoolers so Xavier got to run too. After every race each kid got a ribbon for participating. Sorry for the shakey camera, I was taking video, shooting pictures, holding Aiden, and yelling at Xavier all at the same time...I can only do so much! Also, I haven't quite figured out why it is putting up the split screen, I'm not clicking that button when I make the video but it keeps doing it. So if someone knows how not to get that, send me the how-tos. Hopefully I figure it out soon because it is ticking me off! A couple years ago I thought it would be funny to celebrate not turning 30. So Adam decided to throw me a surprise Not 30 yet party, 10 days before my 30th birthday. He did everything (with a little help from family and friends). I was totally fooled and had no idea. We had it at the train depot in Manhattan. Cake and snacks were served. 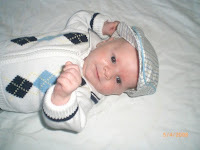 And Adam put together a little video of my baby pictures as well. I'm completely shocked that not only did everyone keep it a secret but that my sisters and my friend Jim kept it from me as well...these are the people that are supposed to tell me everything...I don't know what to think now! The boys had their last soccer game on Saturday. We had a little brunch/party afterwards for everyone at the Wamego park. We had a great team and made lots of new friends. We had a busy weekend! We had a lot of family come into town and a lot of special events took place as well. 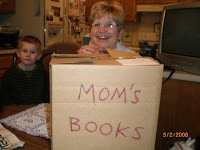 On Friday we went to Chilis for dinner and then back to the Little's house for the unveiling of Karen's books. Karen has always had a dream of writing a children's book and this year we all as a family helped that dream become a reality. 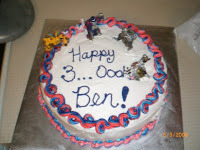 To read more about the details of the book, check out Ben's blog. Not only did Ben and Kelly come into town for Aiden's blessing on Sunday but so did Adam's other brother, Marty and some members of his family. 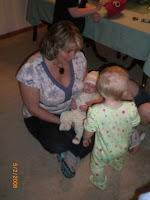 Janna is showing her granddaughter, Shawnee, our little Aiden. Janna is also the first to babysit our new guy. Saturday morning the boys had a soccer game so Janna stayed with Aiden so he wouldn't be out in the cold. It was the coldest soccer game ever...there are no words for it. Saturday night we celebrated Ben's 30th birthday. The best part was the cake...Kelly knows how to make a cake! Aiden was ready to party! Sunday, Adam blessed Aiden at church. In the circle was, Adam, Bishop Hancock, Grandpa Little, Uncles Matt, Ben, and Marty, and our friend Patrick Lewis. We had many friends and family there...Ben and Kelly Dolezal, Marty and Janna Little plus Hunter and Alicia, Jessica and Shawnee Shepherd, Jim and Jan Sipes, Grandpa and Grandma Prewit, Grandpa and Grandma Little, Great Grandma Keith, Ashley Warner, Charla Dawson, Matt and Carrie Craft plus Christopher and Jordan. Yeah we squeezed into 3 pews at church! After, everyone came to our house for lunch. My sister Carrie is playing momma to 4 kittens so we got to see, play, hold, love, and feed them as well. 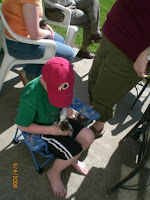 Here is Damon bottle feeding one of the kittens...I think this one was Donald.